My mum cooked her special noodles, fried prawn fritters and made a cold potato-egg-bacon salad. We bought KFC fried chicken, some slaw and nuggets (for the kids) and a roast duck. There was too much food in the end, and everyone had to pack home. 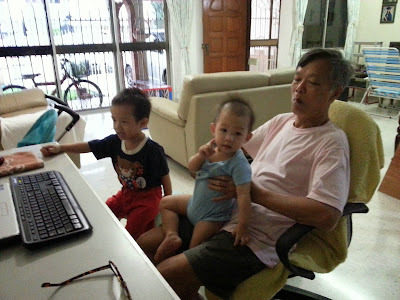 The birthday boys didn't want to blow candles and cut the cake because they were glued to grandpa's laptop showing their favourite shows recorded from YouTube. So mummy only managed to snap a picture with G, boohoo! Thanks Xiao Ying.. A year older liao..
Good Morning, Louiz! 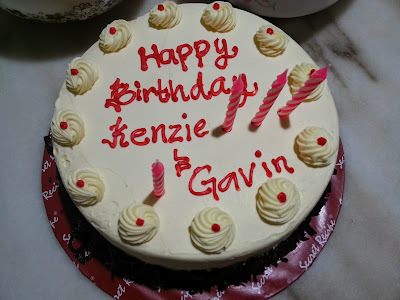 Happy Belated Birthday to Kenzie Boy and Baby G! You know what? I never tasted Red Velvet Cake before wor....Been seeing many RV cake recipes, wanted to try but never did. Maybe this weekend I should attempt and at least I will know how it taste like. I love the Secret Recipe cakes especially their chocolate cakes and cheesecakes. Looks like you all had a nice celebration. 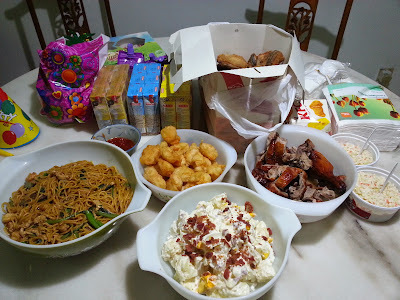 Though simple, celebrating at home with grandparents and nice homecooked/tapau food, is lots better than at a crowded restaurant. I always like having makan at home with family members. More cozy that way. Elo dear.. Was replying to Xiao Ying's comment and I saw yours. I'll be hogging your blog for the RV cake, I mean it! Thanks Chris.. Yeah, too much food in the end, nobody had room left to eat the KFC, so all had to pack home.. Happy Birthday Kenzie and Gavin. Big boys now. Mummy happier and relaxed. Mummy very selfish & greedy.. Want more me-time, want senang, want to be rich, want to jadi siew-nai-nai with $$ falling from the sky, can ahh? You should get the recipe and try to bake. The original seems to have a bit of alcohol for oomph! I've seen COUNTLESS recipes online, but kiamsap coz don't wana buy cream cheese to be used as frosting.. Am still waiting for your RV cake though..
Half kiamsiap only la.. If I purposely buy one block of cream cheese to frost, balance how? Too little to make a cake, end up have to buy another cream cheese block to be able to make into something else ma..
My kids still love birthday cakes and candle blowing even they are going to be 8 and 5 this year. My girl's birthday is next Monday and she has specifically request how her cake going to be. Lol. All kids love cake cutting & candle blowing, even my sister's girl who is same age with Kz, but I dunno why Kz hates candle blowing.. That's why I can't take any family photo during the celebration, sigh..
getting kids to take photos also challenging lah.. you see the last photo, only the Princess Ribbon who is so sensitive to cameras and loves selfie was looking at the camera only, the others did not even bother at all, haha!! but G was looking at his lenglui cousin only lor, while the lenglui cousin was yawning there!! haha.. what a nice candid shot!! aiyah, if Princess Ribbon wasn't looking into the camera hor, then would be even more perfect!! hehehehe, don't misunderstand i say you not pretty lah, but then for a candid shot, it's actually feel better when everyone wasn't aware of the camera hor?? neh, now very "hing" one thing leh, i've forgotten the term used for it.. while taking a photo and everyone was looking into the camera giving their best pose and best smile, then got one person behind "ban guai ban mah" at the background like that.. it gives a very big contrast between the fore and background, but overall the whole feel and effect is very funny geh..
Wahhhhh, SK, your comment is longer than my post jor.. I keep on laughing when I'm reading your comment la.. Am smiling non stop, even until now.. I think I chisin jor.. We celebrated last Saturday at my mum's place la, so it's only 1 week la, where got 2 weeks.. I love your "cele-what-ghost-brate".. cele-mat-yeh-kwai-brate lah, kan? I'm really laughing non stop now.. Eh, my favourite party food are also like yours: fried rice, fried mee, curry chicken, hotdogs, nuggets (or any fried food), sandwiches, and maybe a bucket of KFC.. I sukak! 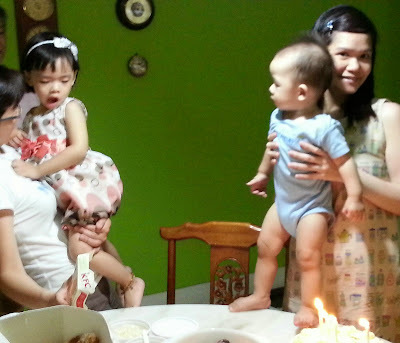 Yep, the two birthday boys didn't know what was happeneing, even Kz.. Tidak apa, tak ada rasa like that.. We wanted to take a family photo ma, I think normal lor, but can't get hold of him.. Asyik mau play only.. He didn't eat anything also leh..
You are right, the adults wanted it, not the kids.. And you know what? My mum wanted it, not me. I would have just bought a RM25 cake, cut it at home with Kz and then tapao "dai chau" after that.. Simple? Wahhhhh!!!! So much food, got nice cake...where got simple like that? Grandpa looks young, probably younger than me and has grandkids already. So nice! Still simple ma.. Compared to those princess-themed birthday parties complete with sweets buffet and clowns and ballon maker, etc.. Oh, I think dad is almost 70.. Happy Belated Birthday to both your adorable boys! Your mother is such a devoted grandmother to your boys to cook them so many yummy food and your dad is also such a devoted grandfather to record their favourite shows for them. Both of them sure cannot get enough of your boys. You also managed to get a very delicious cake for everyone to enjoy. So overall, this birthday celebration is so memorable and meaningful among people who care about each other a lot, rather than those commercialized parties for young children. Nice! good to celebrate together but not my kids even though they are a week apart. Oohh, kam ngam they are a week apart too.. When they are still small, still can celebrate together.. But when they are older, I guess they will request for separate celebration, hehe..
Belated happy birthday to your cute boys! That's quite a lot of food!! Inititially I thought not enuff, somemore I wanted to buy more slaw, mashed potatoes and more chicken, but hubby stopped me, thankfully I listened.. Double celebration!! Happy Belated Birthday wishes to your handsomes, Louiz!! May they grow up giving you great Happiness and Joy!! Thank you dearie.. You also had a fun week I can see, meeting up with friends, go kaikai and makan makan.. Hope I can do like you too..
Yep, I also like, especially the potato salad & fried chicken, keke.. Thanks Libby, if they are bigger, bet they love parties.. Kz & G didn't seem to know what's happening, ended up he didn't blow the candle nor cut the cake, didn't even touch any food. Only we the adults eating in the end..
Hi, happy birthday to your boys! You just reminded me to bake red velvet cupcakes and, also reminiscing my children's birthday parties when they were young. It was fun then and sometime I was like running a one man show cooking,baking and game hosting. Tiring but worth it! Elo, Lian.. Yep tiring (even though I didn't cook anything), but too bad the boys didn't seem to know what was happening, didn't even wana blow candle nor cut the cake.. I love simple celebration at home. The potato egg + bacon salad looks so nice. Must be delicious. Just use mayo ? Add any lemon juice or not ? All the food above are my fav. KFC, roast duck, prawn fritters....... and red velvet. I've never tasted one but heard it is good. Next time will try a piece. Btw, happy belated b'day to your boys ! Mum just steamed potatoes and eggs.. Cut them into pieces, and add Lady's Choice Mayonaise (only this brand can give that potato-egg salad taste, if you know what I mean, I may be wrong, maybe it's just me).. Then she sprinkled bacon bits on top lor.. And chuck into the refrigerator.. Done! Nice ah the red velvet cake from Secret Recipe? Long time didn't buy any cakes from Secret Recipe. I thought their quality had deteriorated over the years. Yeah, it was simple but such a wonderful birthday party. I liked all of the party food and oh my god, that cake was outstanding! I also have been looking for the ideas for a chic outdoor theme for my son’s 18th birthday. Want to surprise him with a fun party at one of his favorite Los Angeles venues. Please share any theme ideas!